In a secondary objective, the Falcon 9’s first stage booster descended back to Earth and slowed down for a jarring touchdown on SpaceX’s drone ship holding position several hundred miles east of Cape Canaveral. The successful launch and landing is the first of two back-to-back Falcon 9 launches planned by SpaceX. 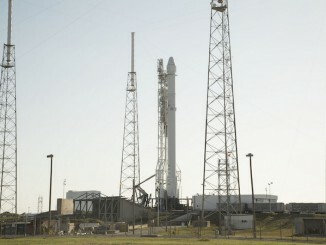 A separate launch team is preparing a Falcon 9 rocket for liftoff Sunday from Vandenberg Air Force Base in California. Running one hour late to conduct additional ground system verifications, the 229-foot-tall (70-meter) two-stage rocket lit its nine Merlin 1D main engines, passed a nearly instantaneous automated readiness check, and climbed away from launch pad 39A at NASA’s Kennedy Space Center at 3:10 p.m. EDT (1910 GMT). 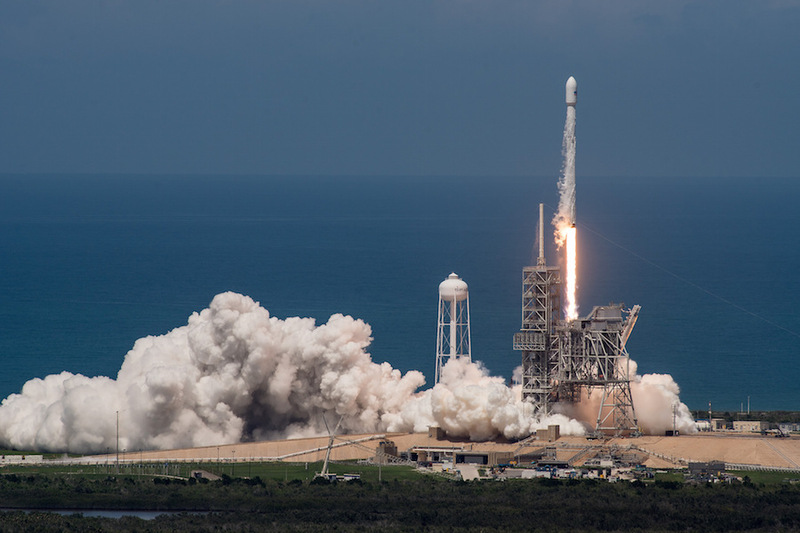 Navigating east from Florida’s Space Coast, the Falcon 9 rocket arced over the Atlantic Ocean on 1.7 million pounds of thrust, soaring to an altitude of more than 44 miles (70 kilometers) before the booster’s first stage shut down and fell away. 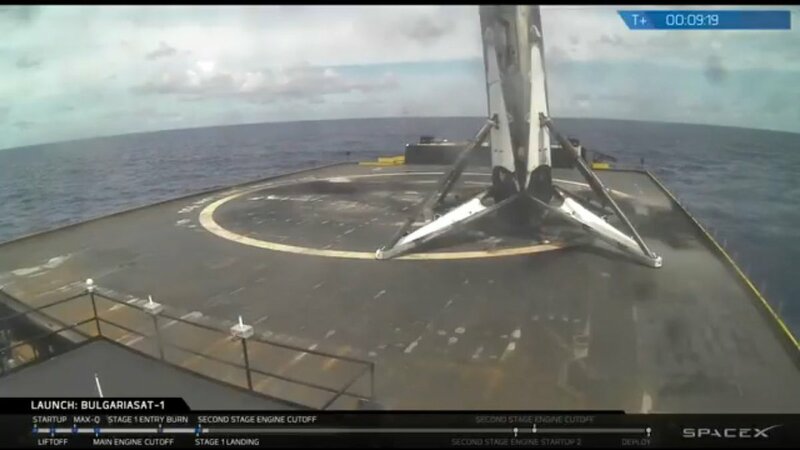 Four landing legs extended from the base of the booster just before touchdown. 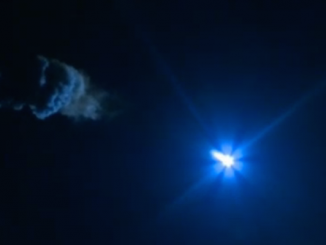 A live video feed from the landing barge cut out during landing, but the first stage was visible on the ship with an apparent lean when video resumed. Elon Musk, SpaceX’s founder and CEO, tweeted that the Falcon 9’s first stage endured its highest-ever re-entry force and heat on Friday’s descent. The Falcon 9 rocket aimed to heave the 8,150-pound (3,700-kilogram) BulgariaSat 1 satellite into a supersynchronous transfer orbit ranging more than 37,000 miles (60,000 kilometers) from Earth. The fuel needed to loft BulgariaSat 1 into such a high orbit left less propellant in the first stage’s tanks for braking maneuvers on descent. “Good chance rocket booster doesn’t make it back,” Musk tweeted before the launch. It turns out the first stage survived the landing, the 12th time SpaceX has recovered one of its rockets intact in 17 tries. The last eight booster landing attempts have been successful over the last year, including recoveries at sea and on land. “Rocket is extra toasty and hit the deck hard (used almost all of the emergency crush core), but otherwise good,” Musk tweeted after Friday’s landing. Friday’s mission was the second time SpaceX has reused one of its rockets, coming three months after the company deployed a commercial SES communications craft with a different recycled booster stage. That vehicle is now retired, and SpaceX says it will go on display somewhere at Cape Canaveral. The rocket reuse effort is geared toward reducing the cost of space launches. SpaceX also has not said when the next Falcon 9 will launch with a previously-flown first stage, but the maiden flight of the Falcon Heavy rocket later this year will use two reused side-mounted Falcon boosters, along with a newly-built core. The heavy-lifter will be powered by 27 engines at liftoff from three modified Falcon 9 first stages bolted together. While the first stage returned to a landing in the Atlantic, the Falcon 9’s expendable upper stage steered the BulgariaSat 1 satellite into orbit with two engine firings. The robotic broadcasting station, built by Space Systems/Loral in Palo Alto, California, released from the Falcon 9’s upper stage around 35 minutes into the mission. Maxim Zayakov, CEO of BulgariaSat and its affiliate Bulsatcom, said the satellite was healthy following Friday’s launch. He said ground controllers established contact with BulgariaSat 1 as expected a few minutes after deployment from the launcher. Power-generating solar arrays were scheduled to unfurl on the satellite later Friday, and a series of on-board engine burns will reshape BulgariaSat 1’s orbit at an altitude of around 22,300 miles (35,800 kilometers) over the equator over the next 10 days, Zayakov said. The satellite should enter service in geostationary orbit by early August, starting a 15-year mission beaming television across Bulgaria, Serbia and neighboring regions in the Balkans. Controllers will park BulgariaSat 1 along the equator at 1.9 degrees east, where its movement around Earth will match the rate of the planet’s rotation, giving the spacecraft constant coverage over Europe. In an interview with Spaceflight Now before the launch, he credited SpaceX’s cost-cutting ways with making space accessible for small nations and money-conscious companies like his own. The BulgariaSat 1 project cost $235 million, Zayakov said, including the purchase of the satellite from Space Systems/Loral, launch services, insurance and ground systems. The terms of the satellite contract made SSL responsible for booking the launch with SpaceX, along with procuring insurance coverage, and BulgariaSat will take control of the spacecraft once it is ready to begin service in orbit. Zayakov said BulgariaSat saw no financial benefit from swapping a new rocket for a used one, and any discount in the deal went to SSL. “SSL engineers who work with all the launch providers were involved in this case, and they were convinced of the overall reliability of the booster to reuse it,” Zayakov said in an interview. Bulsatcom’s satellite television channels will be broadcast through BulgariaSat 1 into homes and businesses across Bulgaria. A Bulsatcom subsidiary in neighboring Serbia will also relay TV channels through BulgariaSat 1. 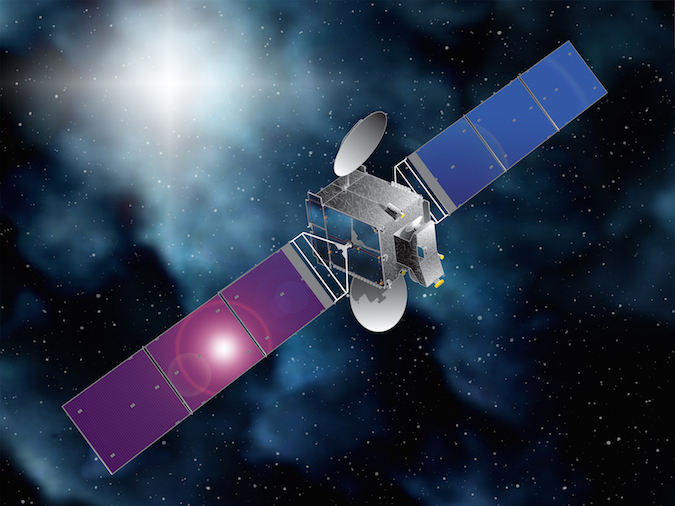 Bulsatcom currently leases transponders on Hellas-Sat 2, a 14-year-old satellite launched from Cape Canaveral on an Atlas 5 rocket in 2003. BulgariaSat 1 will add significantly more capacity to the company’s network. “TV is the focus,” Zayakov said of BulgariaSat 1. “We’re trying to provide much higher quality and much better quantity of services to our customers, not only in our country, but also in the region, and trying to expand. Certainly, more HDTV and some 4K channels. BulgariaSat 1’s launch was pushed back from June 15, first by delays in a previous Falcon 9 launch, then to replace a pneumatic valve on the rocket’s payload fairing, the composite shroud that covered the satellite during the first few minutes of flight. The smooth flight Friday sets the stage for another Falcon 9 mission — an all-new vehicle — set for blastoff at 4:25 p.m. EDT (2025 GMT; 1:25 p.m. PDT) Sunday from Space Launch Complex 4-East at Vandenberg. The launcher will deliver 10 more satellites to join Iridium’s upgraded mobile voice and data relay network, comprising dozens of spacecraft orbiting a few hundred miles up. 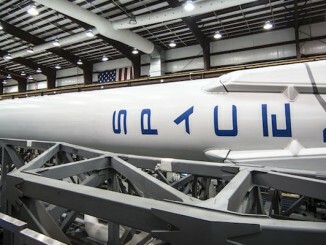 SpaceX has not launched two Falcon 9 rockets in such a short timespan before. The next Falcon 9 mission from Florida is scheduled some time next month with the Intelsat 35e communications satellite.